Ah, I was very positively surprised when, for once, I received a jazz/fusion album that is not 95% jazz. 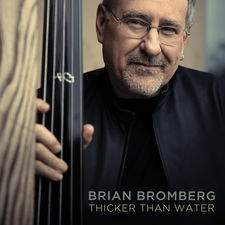 BRIAN BROMBERG has been releasing solo albums since 1986 and he’s a magic bass player, who’s also playing in RANDY WALDMAN TRIO. The music on this CD is the type of jazz/fusion that has lots of elements of funk, rock, pop and occasional folk vibes. But to me what differs the most from so many other jazz/fusion albums of today is the melodies. These melodies speak to you, where other albums are often too jazz oriented and messy. Some songs are even almost totally without jazz parts! The list of players is huge, so I’ll mention just some of them: EVERETTE HARP (sax), LENNY CASTRO (percussion), PAUL JACKSON Jr (guitar), GEORGE DUKE (piano) but also many more. Frequent players are for example drummer FRANKLIN RICHARDSSON III and TOM ZINK on keyboards/piano. “Coupe de Ville” is a fine example of the less jazz oriented songs, with great solo melodies. It’s more like soul/pop/rock in an instrumental overcoat. Same goes for the lovely “It’s called life” with awesome sax playing by BRANDON FIELDS. It also has to be underlined that the horn section is massive almost throughout the album! Not the exact same guys on each tune, even though some of them are heavily involved. Another strength is that this CD gives both softies and rather funky songs. A great variation, simple as that, and all songs are very good. Needless to say, the musicianship is flawless. On the soft side there is for example “Your eyes” with MARIAN MEADOWS on saxophone. I also need to mention that Bromberg is the producer himself, and apart from the top notch bass playing he also plays piano on the just mentioned song. “Land of the rising sun” is a song where we get some folky (and even oriental) vibes – a bit like some of Swedish JANNE SCHAFFER’s songs. The only thing I would change is the length of the parts where Brian plays solo bass with no other musicians playing. It feels like clinic stuff and it does not really match the rest of the album. Still marvellous playing. Well, this is a very nice jazz/fusion album if you like them melodic. A fine Christmas gift as well, because this works as a cool carpet of music in the background too.